The ECE Program provides a strategic balance of depth and breadth in topics appropriate to the areas of Electrical and Computer Engineering as articulated by the Institute of Electrical and Electronic Engineering (IEEE) in their program criteria developed by the Accreditation Board for Engineering and Technology (ABET: www.abet.org). Our program provides a foundation of mathematics, sciences, and the humanities, combined with engineering topics. However, what sets Rowan ECE program apart is its hands-on, real world project-based technical curriculum, where every class includes a laboratory component, with its hallmark Engineering Clinics. It will stay with you for 4 years. Same curriculum information, but for those who prefer a visual representation: our handy dandy cheerful curriculum flowchart – color coded, no less! The advising and progress check sheet essentially provides the same curriculum information, but also allows you to track your progress through the curriculum. This is the sheet used by faculty advisors. Only for the most dedicated… everything you want to know about every class offered in every program on this campus! Engineering students who plan to pursue a career in business should consider the combined degree program for obtaining a BS in Engineering and an MBA (Master of Business Administration). Students wishing to pursue the combined BS/MBA degree have several options and may be able to complete the MBA program in one year and one summer, depending on when the student wants to start the program. Completion of foundation courses: Applicants to the MBA program must have completed appropriate courses in mathematics, economics, and various business areas. Some of these courses can be taken as part of the undergraduate engineering coursework while others can be taken during summers. Planning is the key: Once admitted into the Combined Program, students are assigned an advisor from the College of Engineering to assist them in designing a program of study to meet their needs. In the senior year, an additional advisor is assigned from MBA program. Students who wish to enter the program during the freshman year should notify the Associate Dean of Engineering by March 1 of the year they wish to begin the program. Engineering students can be conditionally admitted to the MBA program as an incoming freshman or at any time during their undergraduate programs. A minimum Graduate Management Admission Test (GMAT) score of 450. A total of at least 1050 points based on the following formula: (GPA * 200) + GMAT score > 1050. An additional 100 points can be awarded for approved managerial work experience. Completion of required foundation courses before starting the MBA Program. The engineering degree is granted upon completing all requirements at the end of senior year. The MBA degree is granted upon completing all requirements with a grade point average of at least 3.0 in the MBA courses (the work toward the MBA degree can be pursed as a part-time or full-time student). ECE Students can choose from a long list of disciplines that offer a Minor option. Obtaining a Minor typically involves taking a set number of additional courses, determined by the department offering the minor, and once completed the Minor is indicated on your transcript. 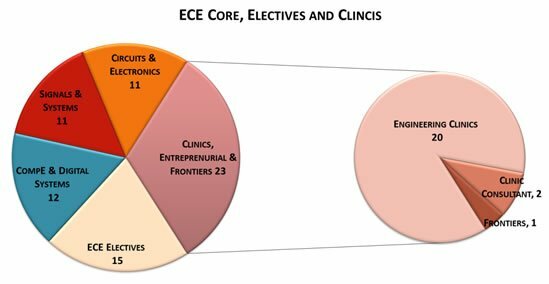 For ECE students, getting a Minor in certain disciplines is easier than others, because some of the courses required by the ECE curriculum can be counted towards the Minor in those disciplines. 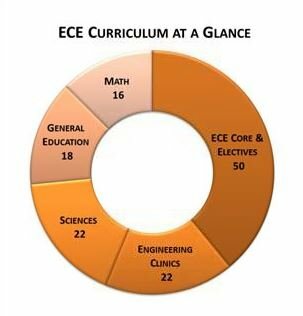 The most popular Minor options for ECE students are Computer Science, Mathematics, and Physics. The requirements for these Minor options can be found in the links below. However, since the departments can change the Minor requirements at any time, and/or change the links to relevant information, please make sure to contact the relevant department and talk to an advisor in that department before you embark towards a Minor. Minors are also available Chemical Engineering, Civil & Environmental Engineering and Mechanical Engineering. For additional information, please see the following links. Take a minimum of 8 credits (two lab courses) from an approved list of Biological Science Electives, such as courses from the Anatomy / Physiology bank or from the Cellular, Molecular Biology bank of the Biology program. 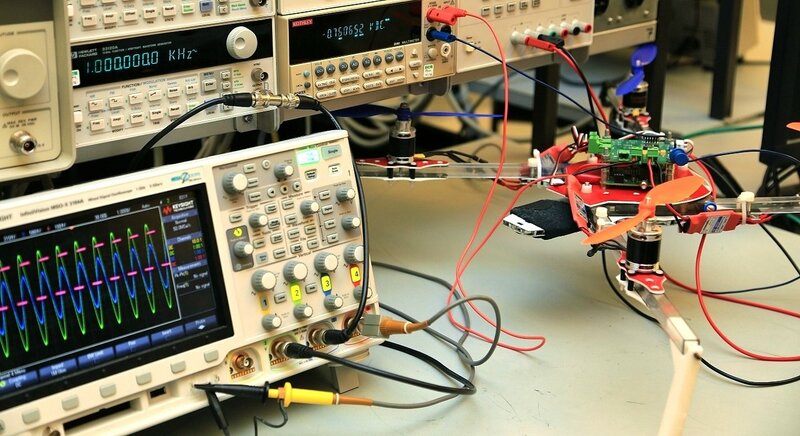 The ECE department offers a concentration in Systems Engineering. Students can typically complete a concentration by taking three additional classes. This concentration is designed in collaboration with industry experts, and its flagship course, Introduction to Systems Engineering is regularly taught by experienced high-level systems engineers and executives in major area engineering companies to provide the unique industry perspective. For additional details and complete information, please see Systems Engineering Concentration Guidelines. * Business Logistics class has a prerequisite that will be waived for Engineering students. Please go to the Marketing Department chair and request the prerequisite override. In collaboration with Lockheed Martin Company, the ECE department is now offering a new certificate program, called Certificate of Undergraduate Studies (CUGS) in Combat Systems Engineering (there is also a Certificate of Graduate Studies (COGS) in Combat Systems Engineering (CSE), described in the Graduate Studies section of our website). These certificate programs are intended to help develop the growing workforce needs of the area’s prominent defense industry. In fact, all classes are taught in cooperation with Lockheed Martin engineers. Active participation and successful completion of this program can certainly increase your chances of getting one of those highly sought-after and well-paying defense industry positions. This program is most closely aligned with electrical and computer engineering topics, and therefore offered by the ECE Department. However, it is open to any engineering student who has an interest in the field. Non-ECE students should pay close attention to the prerequisites of the classes in this CUGS. Note that the university rules allow up to two classes in a CUGS program to be counted towards graduation requirements of the associated major degree. ECE Students: Of these four classes, two of them – ECE 09.423 Introduction to Radar Systems and ECE 09.425 Introduction to Command and Control – will count towards ECE BS degree requirements, whereas the remaining two classes, ECE 09.424 Introduction to War Gaming and C4ISR and ECE 09.426 Introduction to Weapon Systems need to be taken in addition to all other regular ECE requirements. Non-ECE students should check with their departments and advisors. An ECE minor represents an excellent opportunity for students in other technical and scientific majors to expand their knowledge and employment opportunities. The ECE minor provides undergraduate students from mathematics, the physical and biological sciences, and the other engineering disciplines the required background to broaden their scientific and engineering knowledge in ECE, as well as for pursuing graduate work in ECE at Rowan or elsewhere. Admission requirements include approval of department head and a minimum GPA of 3.0. Students interested in ECE minor should speak to their faculty advisor as well as ECE Minor advisor, Dr. John Schmalzel for additional information. Applications are accepted in the Fall for the following Spring term (deadline November 1), and in the Spring for the following Fall term (deadline March 15). The online application is available at the following link: http://tinyurl.com/minor-engr. Additional resources for students who want to pursue a Minor in Engineering are provided below.